I have so much to be thankful for. I have my own garden and can shop for everything else I need at local farms and my favorite markets. I get to spend a good deal of time preparing my choice of foods. I get to feed myself, my family, and my friends, and all the while I get to take pretty photos and share them, along with my favorite recipes, with you. I feel so lucky. Thanksgiving is tomorrow and there will be lots of beautiful and delicious food on my table. It is a painful fact, however, that not everyone will have such a bountiful spread. So today, I’m not sharing a food photo or a recipe. 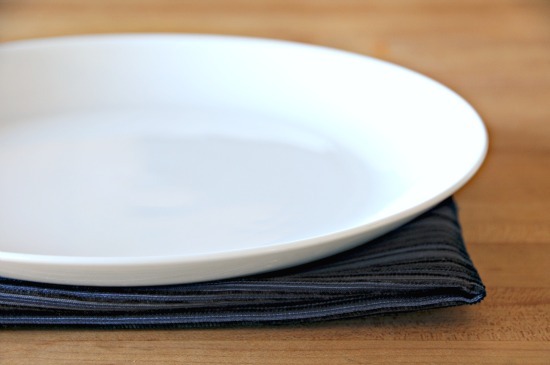 Inspired by my friend Jennie Perillo, I’m sharing an image: an empty plate. This plate represents everyone who will go without enough to eat this Thursday, throughout the holiday season, and perhaps every day this year. Please take a moment to consider what you can do to help. Jennie and I have made donations to Share Our Strength. Won’t you join us? There are numerous organizations working to end hunger. Local food banks, national and global agencies…they all need our help. Please give what you can to help close the hunger gap. Thank you, and have a wonderful Thanksgiving. Wow. What a powerful post. I’ve been inundated with so many amazing food recipes that I almost forgot how many people will go without food tomorrow. Thank you for taking the time to mention this important issue. I hope you have a blessed day with your family and friends tomorrow. So perfectly said Winnie, and I for one am thankful to call you a friend. So glad we got to meet, and look forward to breaking bread together again soon. Happy Thanksgiving—Jennie. Well said Winnie. And as they say, a picture says a thousand words and this one packs a punch. We do indeed have so much to be grateful for.